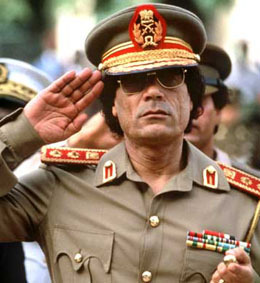 A dictator known as much for sponsoring international terrorism as his impeccable fashion sense, Libya's self-proclaimed "Guide of the Revolution" took power in a September 1969 military coup which deposed King Idriss. One of Colonel Muammar Qaddafi's first acts as dictator was to rework the calendar and rename all the months. He also published the Green Book -- not really an answer to Mao's Little Red Book, but rather a triad of brief pamphlets on the topics of Democracy, Economics, and Sociology. President Reagan's personal appraisal of the man: "I find he's not only a barbarian, but he's flaky. [...] I just think that the man is a zealot." Primarily at issue was Qaddafi's longstanding support for international terrorism. He played host to both Abu Nidal and the infamous assassin Carlos the Jackal. In all likelihood, Qaddafi ordered the bombing of Pan Am flight 103. In August 2003, Libya agreed to pay $2.7 billion to families of the 270 killed on board Flight 103 when it exploded in December 1988 over Lockerbie, Scotland. Just six months after the settlement, Qaddafi was visited by British Prime Minister Tony Blair in Tripoli.